On May 07-10, 2018, the joint ISSI-BJ/ISSI workshop on “Tropical and Subtropical Cyclones with Improved Satellite Observations” was successfully held at our premises. Over 40 scientists from 6 countries participated in this meeting, convened by Xiaolong Dong (ISSI-BJ and National Space Science Center, Chinese Academy of Sciences, China), Hui Yu (Shanghai Typhoon Institute, China Meteorological Administration, China), Mark Bourassa (Florida State University, USA), Ji Wu (NSSC/CAS, China), Anny Cazenave (International Space Science Institute andLaboratoire d’Etudes en Géophysique et Océanographie Spatiales, France), and Lennart Bengtsson (Emeritus Scientific Members of Max Planck Institute for Meteorology). Tropical and subtropical cyclones, including typhoons, hurricanes, tropical storms, cyclonic storms and tropical depressions, have significant impacts on a large region from northwestern Pacific Ocean, northern Indian Ocean, northestern Atlantic Ocean, to the south Asia subcontinent and most part of China, east Asia and Australia. They are not just key weather and climate factors, but also have significant social impacts and influences on the global and regional circulations and water and energy cycles. 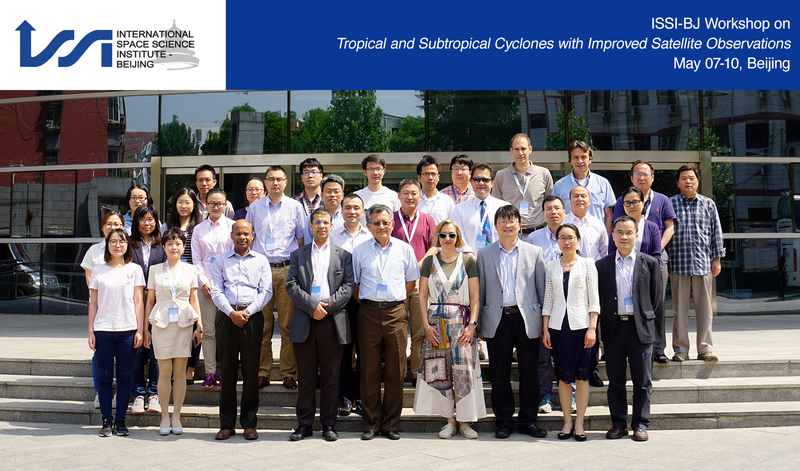 This workshop reviewed the key science questions of tropical cyclones and the related extreme weather events, and discussed new developments and contributions of satellite observations to these important scientific questions and applications. Contributors covered atmospheric and meteorological research and users, and satellite remote sensing communities. The workshop started with an introduction and an overview of tropical cyclones, followed by the session on observations of ocean surfaces, which was continued on the second day as well. On the third day, the speakers covered the topics related to the observations of atmospheric thermodynamics and precipitations. Modeling, analysis, assimilation and forecast of tropical cyclones were discussed on the last day of the workshop. Under its special program for supporting young scientists, 3 early career scientists were invited to present at the Workshop. The Young Scientist participation is intended to give early career scientists working on the broad scientific topic of the workshop an opportunity to present their projects in front of the expert audience, and to initiate fruitful discussions with these experts. Following the Workshop, its output will be published as a volume in the “Space Science Series of ISSI/ISSI-BJ” by Springer, after publication of the chapters as peer-reviewed papers in the journal of “Surveys in Geophysics”. At the end of each session, plans about the book preparation were also discussed.